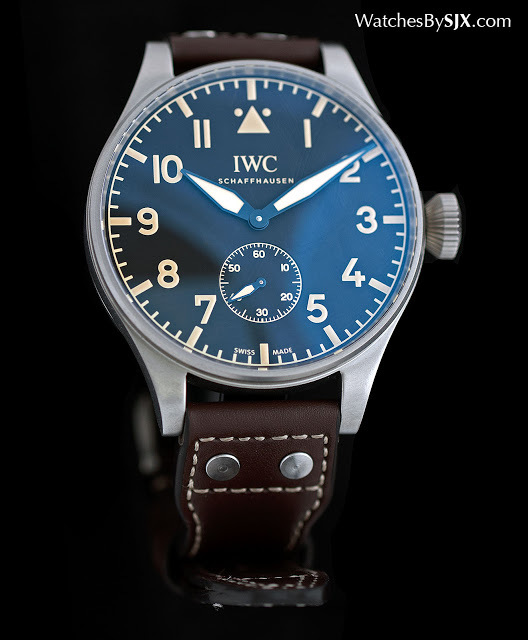 Traditionalists will like the new IWC Pilot's Watches, which made up the entirety of its offerings at SIHH 2016. 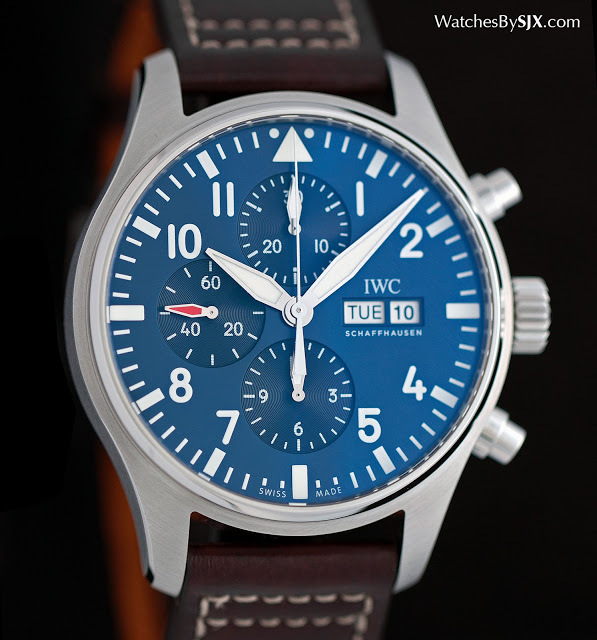 The face-lifted aviator's timepieces are styled more attractively, and also more affordable. Here's all you need to know, complete with original photography and prices. 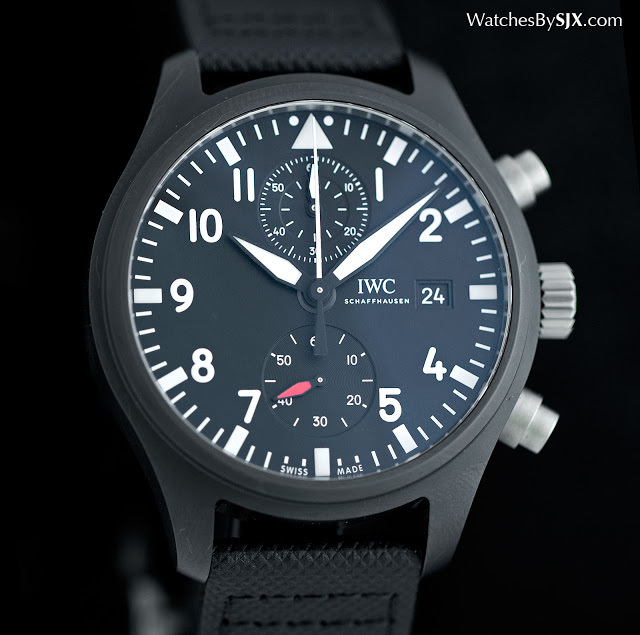 IWC face-lifted its entire line of Pilot’s Watches at SIHH 2016, giving existing models a makeover that tended towards the unfussy and practical. 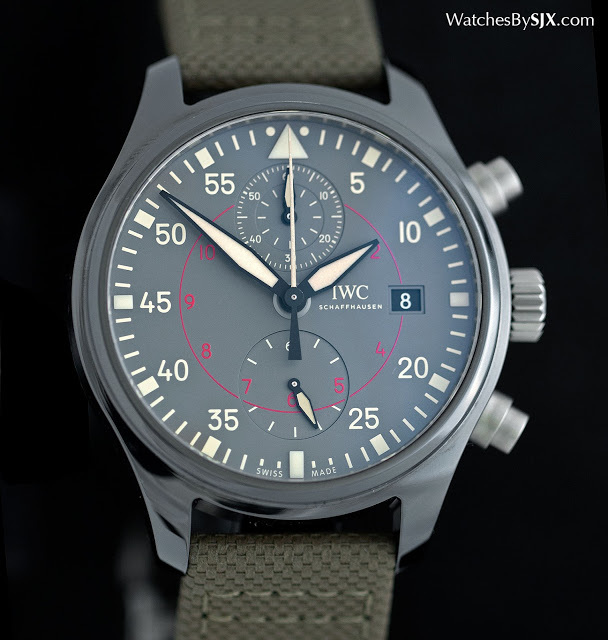 And IWC also adding a handful of new watches to the line-up, namely the Pilot’s Watch Timezoner Chronograph and a smaller pilot’s watch for ladies. Importantly, the new Pilot’s Watches are mostly priced lower than the models they replace. 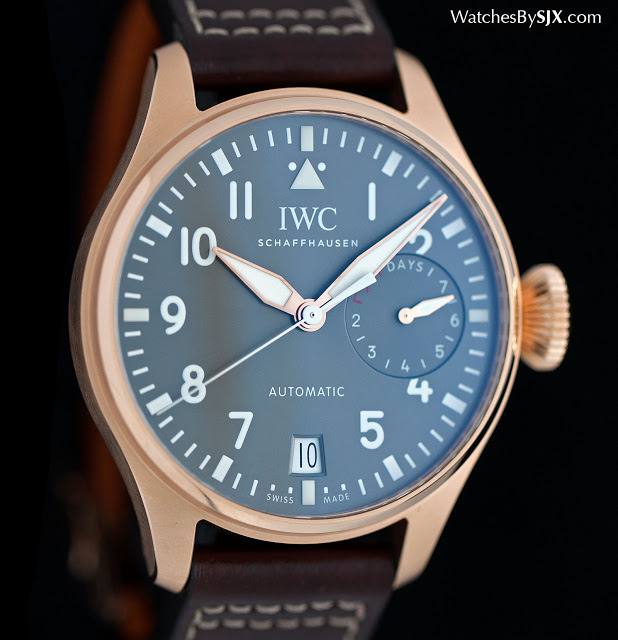 While SIHH last year was all about the Portugieser line, with a collection that included several new movements, the Pilot’s Watches of 2016 are mainly aesthetic exercises. 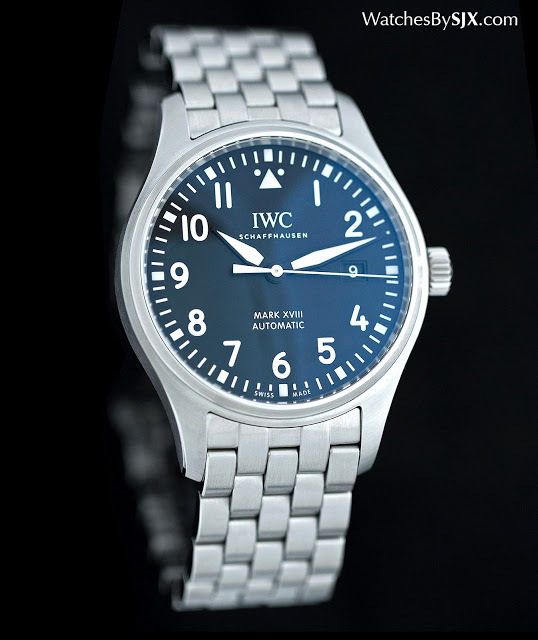 Nonetheless the redesigned Pilot’s Watches will go down well with traditionalists, since the new look is more streamlined, doing away with controversial features like the absent “9” and triple-date window. The most basic watch in the line-up is the Pilot’s Watch Automatic 36, a smallish 36 mm watch obviously intended for ladies. 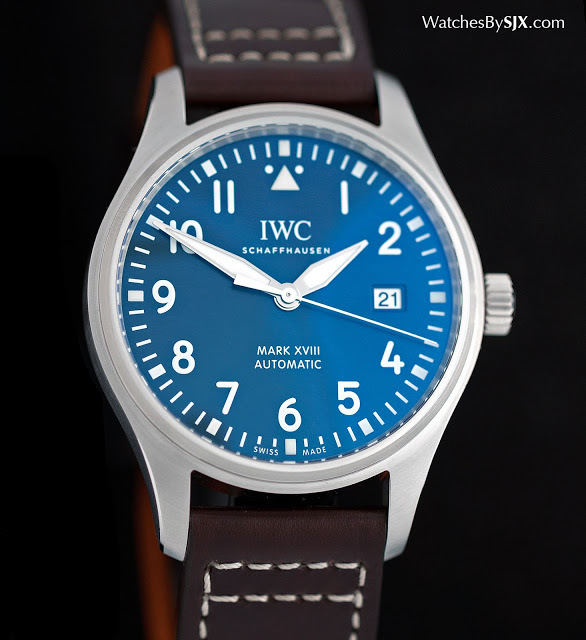 It keeps to the typical pilot’s watch look, but with slightly more fashionable dial options as well as Santoni alligator straps (though an unfeminine steel bracelet is an option). Unusually the case is mirror-polished all around, instead of having alternating brushed and polished surfaces as on the men’s models. Inside is a low cost but robust Sellita movement, explaining the affordable price tag of US$3950 or S$6250 on a leather strap. Also powered by the same Sellita movement is the Mark XVIII, the latest in a long line of time-only aviator’s watches that started with the Mark XII. 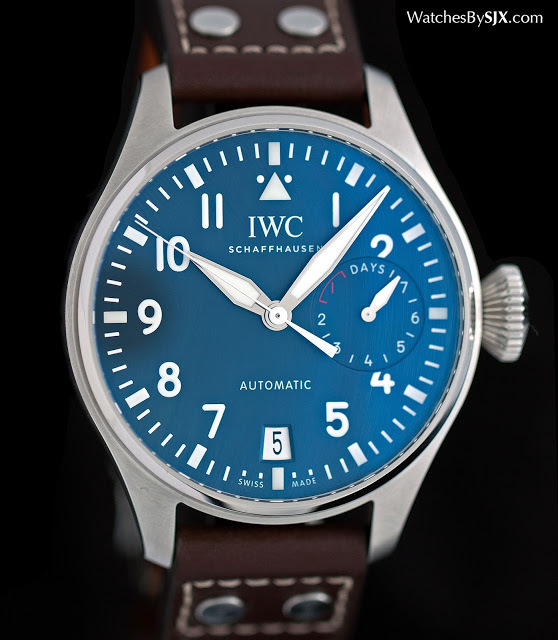 The entry-level men’s Pilot’s Watch, the Mark XVIII is 40 mm in diameter and available with a white, black or “Le Petit Prince” blue dial. Both versions have a date window that three o’clock that is relatively well camouflaged, though it sits too close to the centre of the dial (because the movement is small but the case large). 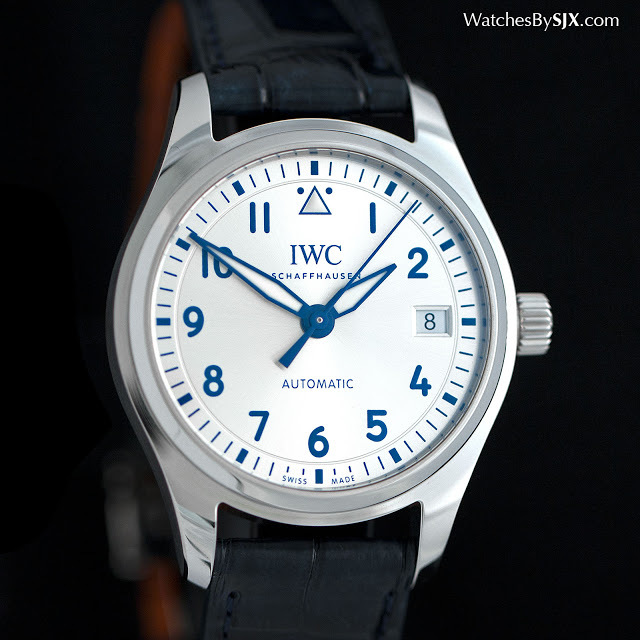 The white dial model is notable because it revives a dial colour last seen several generations ago. 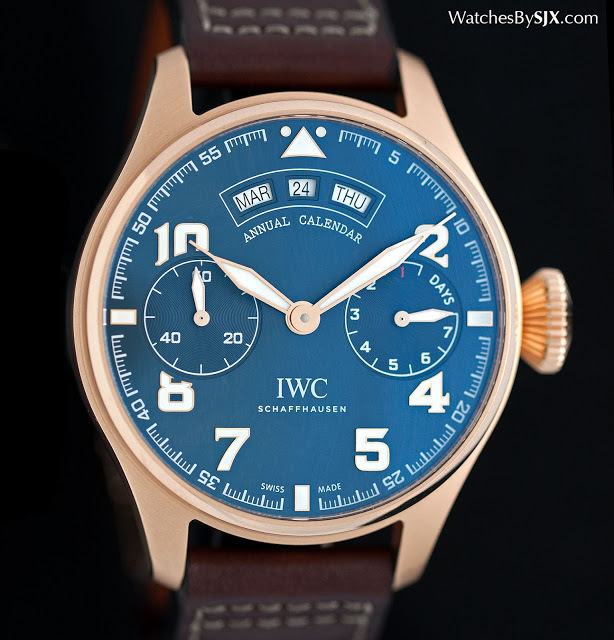 On the other hand, the blue dial Mark XVIII “Le Petit Prince” is similar to past limited editions, which will displease owners of the ostensibly limited editions, but is probably the most interesting looking of the trio. 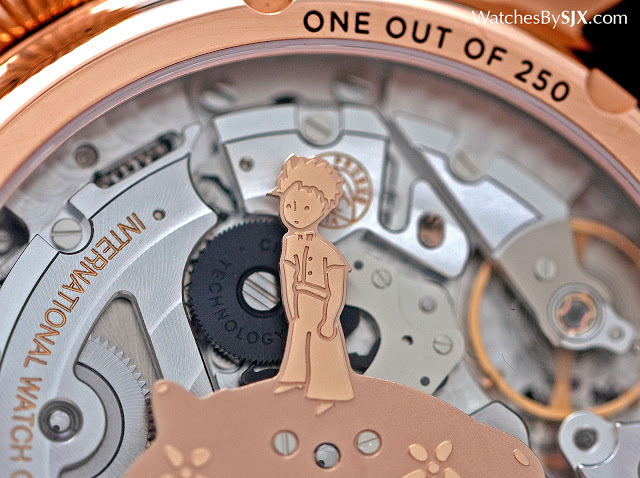 Like all other Le Petit Prince models, the case back features an engraving of the titular character. All three are priced at US$3950 or S$6250 on a leather strap, with the bracelet costing about US$1000 more. Another option is a canvas NATO-style strap that can be purchased separately. And then there’s the Mark XVIII Top Gun Miramar, distinguished by its glossy black ceramic case (which looks a bit downmarket compared to matte ceramic). 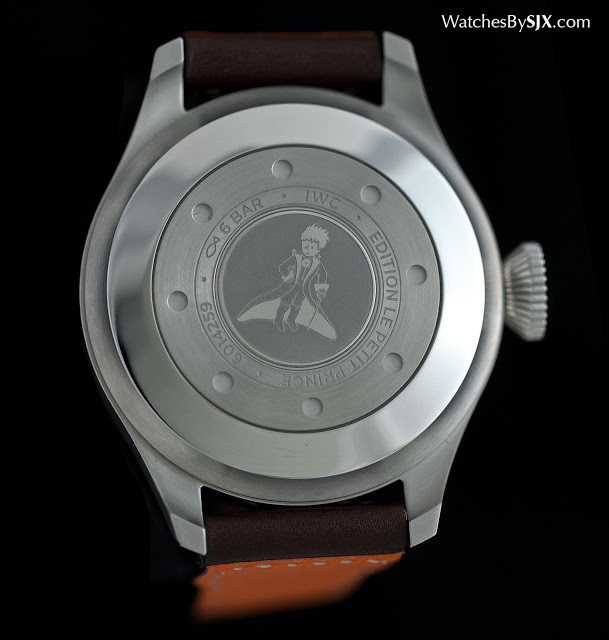 Slightly larger at 41 mm in diameter, it has the same movement as the basic Mark XVIII models. This costs US$5400 or S$8350. 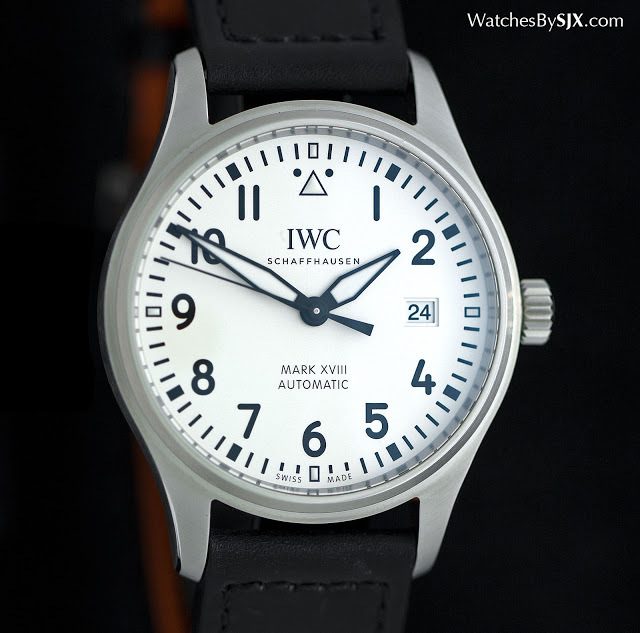 Similar in function to the basic Mark XVIII is the more elaborate Big Pilot’s Watch, all of which are powered by IWC’s in-house seven day automatic movement (though whether calibre 5000 or 52000 depends on the model). 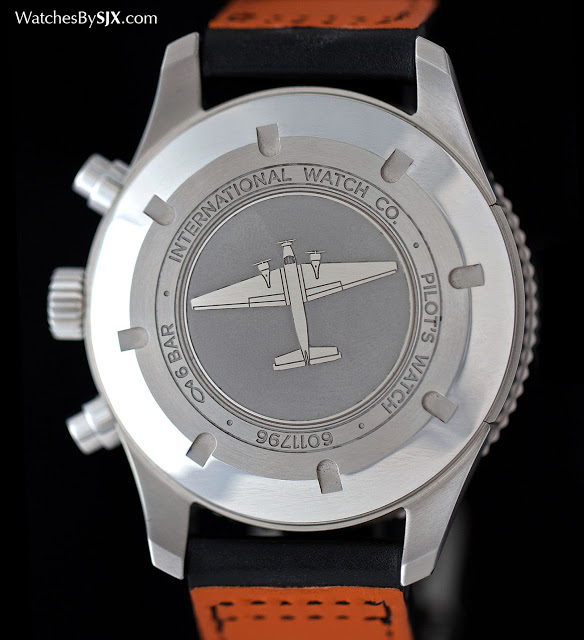 The entry-level Big Pilot’s Watch is steel and 46 mm in diameter. It is priced at US$12,900 or S$19,700. 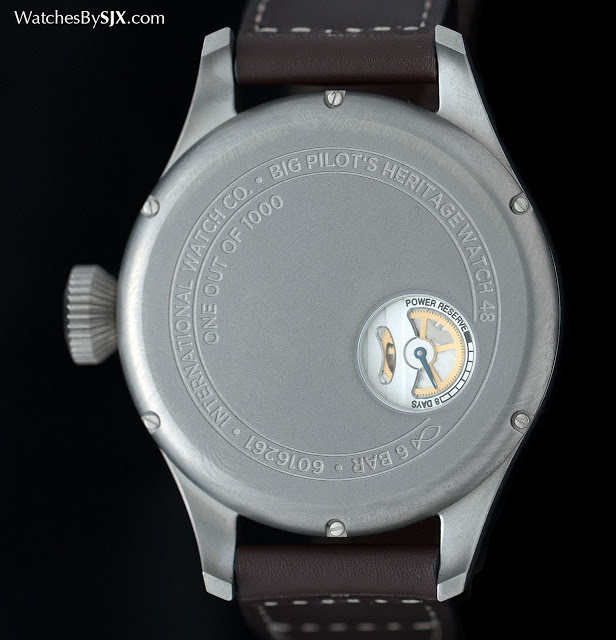 With the same specs and price, but arguably better looking is the Big Pilot’s Watch “Le Petit Prince”. Named after the charming novel, this features the deep blue dial that is typical of the Le Petit Prince editions, but unlike earlier models this is part of the regular collection and not a limited edition. The top of the line Le Petit Prince model is the Big Pilot’s Watch Annual Calendar Edition “Le Petit Prince”, available only in red gold. Large and attractive looking, this is a limited edition of 250 pieces, with a rotor that is unique to this model. Made of red gold, it’s a cast relief of the Little Prince standing on a planet. This will cost S$49,600, or approximately US$35,000. Also in red gold is the Big Pilot’s Watch Spitfire, with a pale grey dial that’s standard on the Spitfire models. 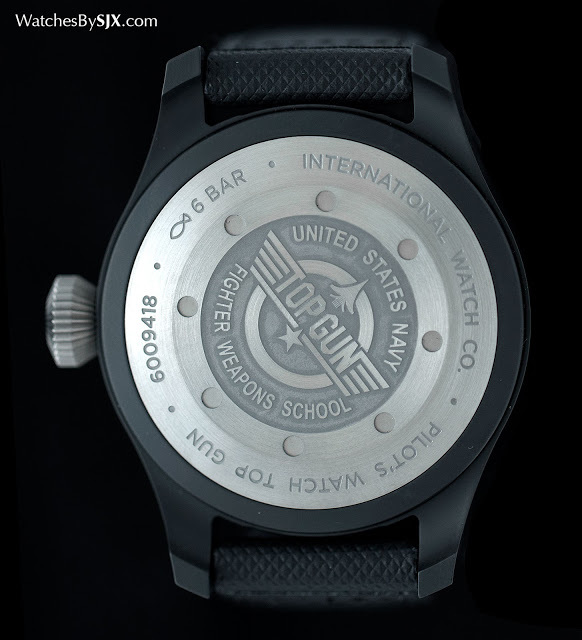 The Big Pilot’s Watch Top Gun, on the other hand, is in matte black ceramic. Unlike the earlier generation of Top Gun watches that were shamelessly emblazoned with prominent logos, the new Top Gun looks more fit for purpose. There is no logo on the case side, and a monochrome, engraved logo on the back, instead of a printed plastic insert. 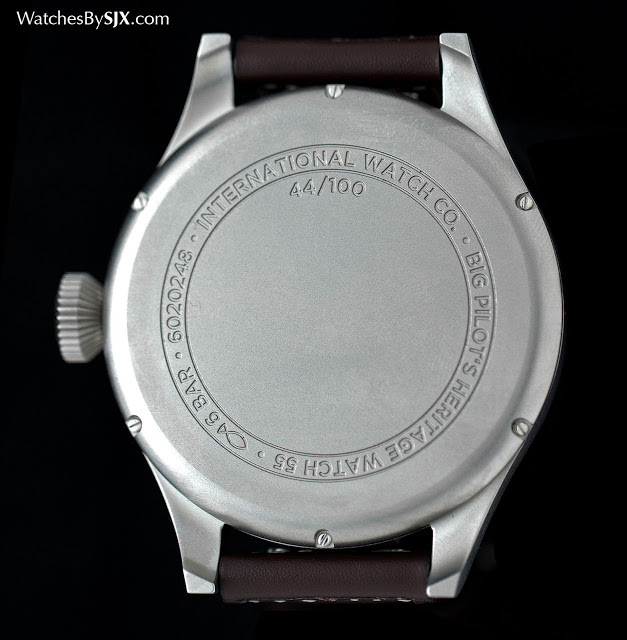 And it is also smaller at 46 mm, compared to the 48 mm of the previous generation. The price tag is US$13,500 or S$21,100. 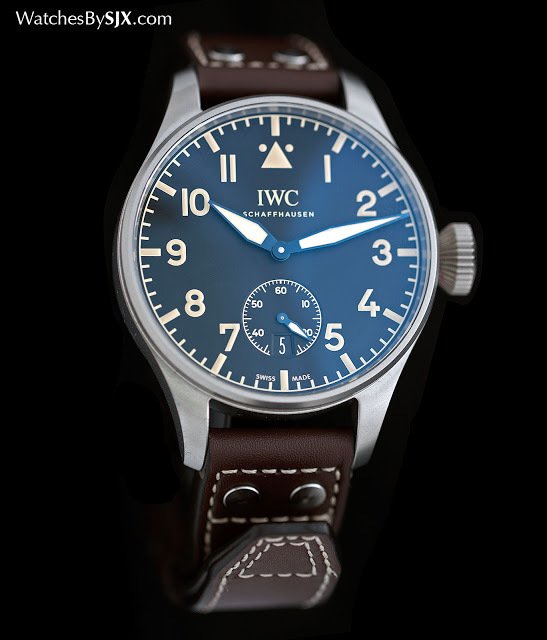 The last is a 250-piece limited edition, the Big Pilot’s Watch Edition “Boutique Rodeo Drive”, named after the IWC store in Beverly Hills. 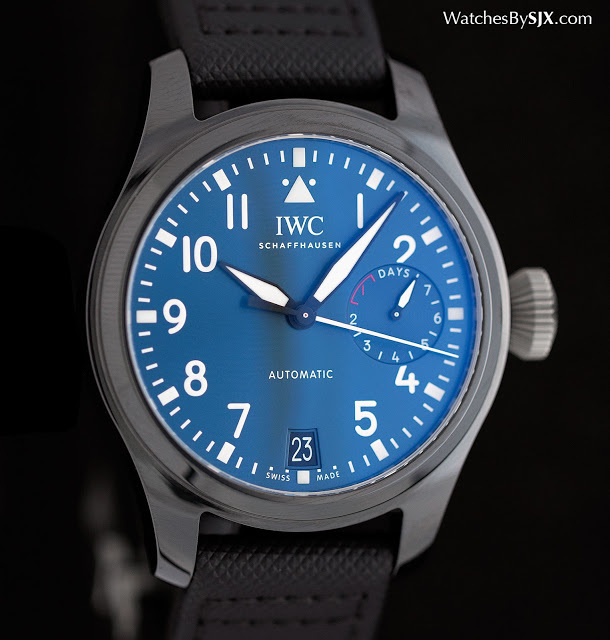 It combines a glossy, 46 mm ceramic case with a metallic blue dial – a combination that would not appeal to those who prefer the traditional, no-nonsense aviation watch look. This costs about US$1000 more than the Top Gun. 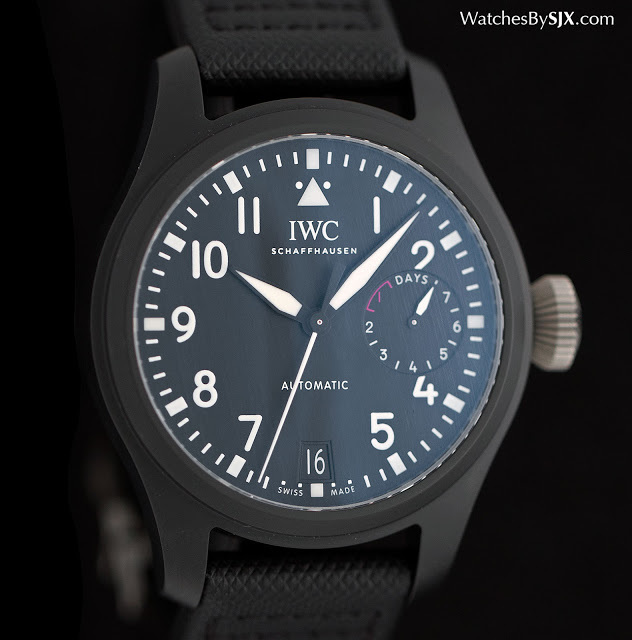 If the 46 mm Big Pilot’s Watches are not big enough, IWC also introduced the Big Pilot’s Heritage Watches, a pair of limited editions 48 mm and 55 mm in diameter respectively. 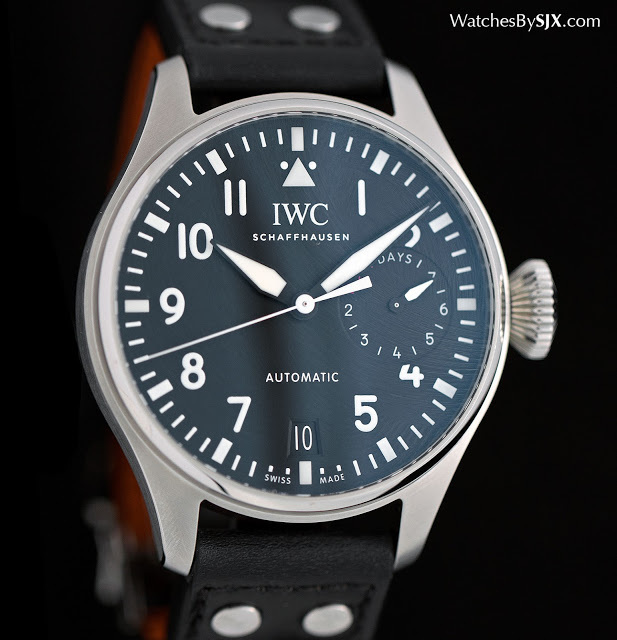 Both are titanium, with a look loosely based on the Second World War beobachtungsuhr IWC made for German airforce navigators. Comically large at 55 mm in diameter, the Big Pilot’s Heritage Watch 55 is a 100 piece limited edition powered by the hand-wound F.A. Jones movement. It will cost US$14,800. At 48 mm in diameter, the Big Pilot’s Heritage Watch 48 is smaller, but still enormous. Limited to 1000 pieces, this is powered by a hand-wound, eight day movement with a power reserve display on the back. 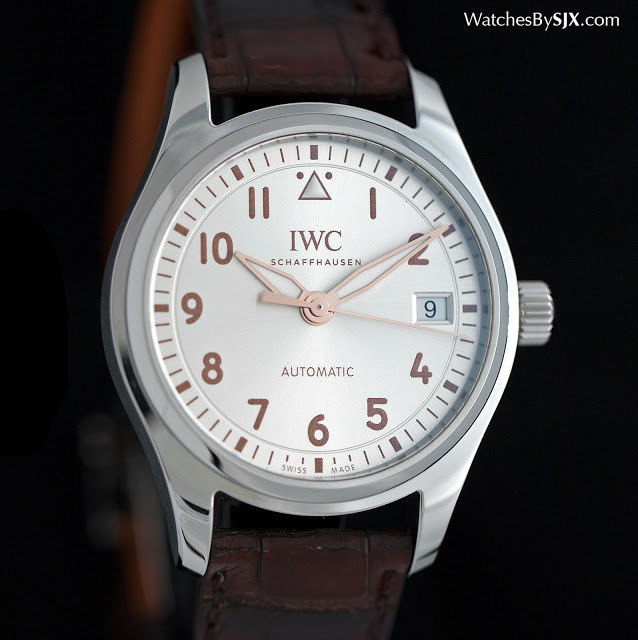 It’s the same movement as the one inside the Portuguese Hand-Wound Eight Days. Price is US$13,400. 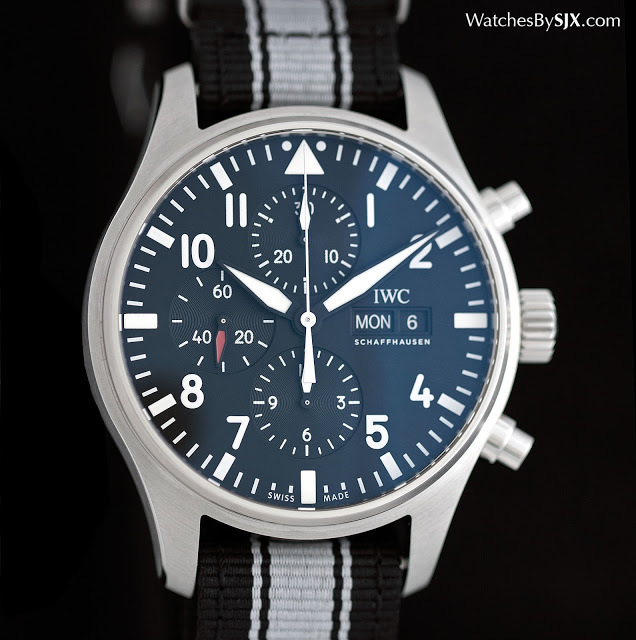 Next is the Pilot’s Watch Chronograph. As usual the most basic version is stainless steel with a black dial. 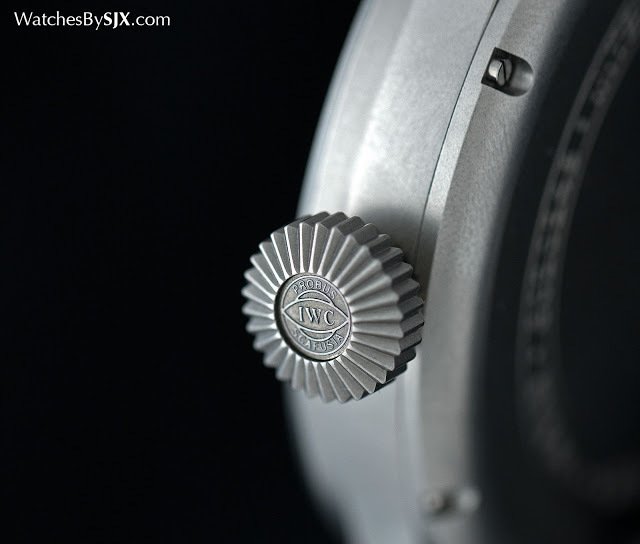 It’s 43 mm in diameter, with the hardy Valjoux 7750 inside. It’s US$4950 or S$7650 on a leather strap, while the bracelet costs US$1000 more. A NATO strap is also an option. 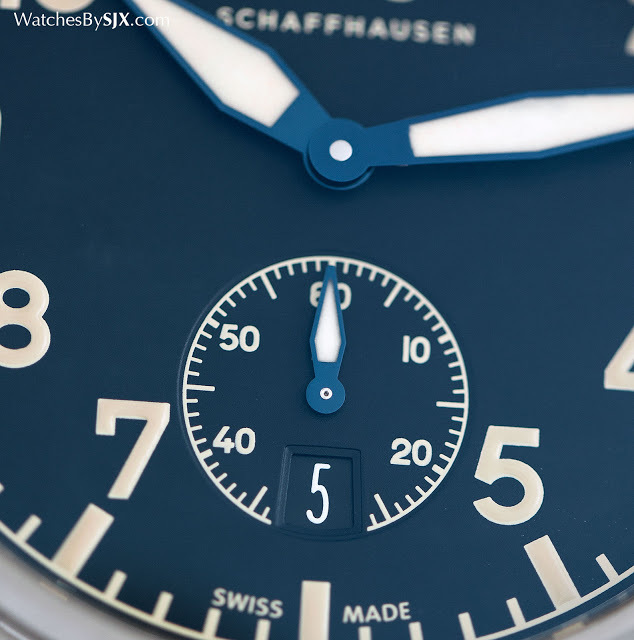 There’s also a Pilot’s Watch Chronograph “Le Petit Prince” with a blue dial that is not a limited edition, for the same price. 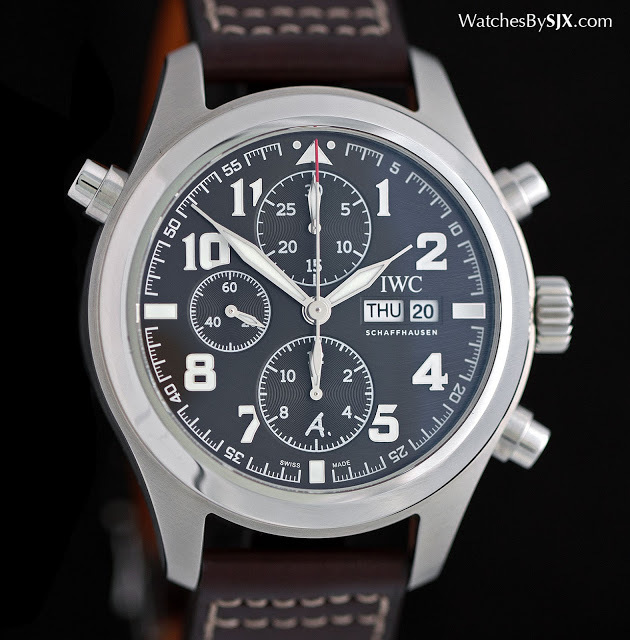 And also a Pilot’s Watch Chronograph Spitfire with a grey dial, also priced the same. The fancier chronographs start with the Pilot’s Watch Chronograph Top Gun, with a matte black ceramic case and the in-house calibre 89000 movement. 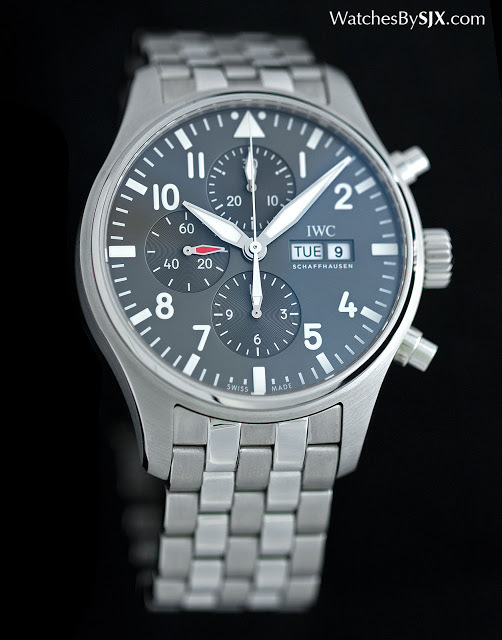 It is automatic, with a flyback chronograph function. It’s a more manageable 44 mm in diameter, while the earlier generation was 46 mm. This is priced at US$10,900 or S$16,900. 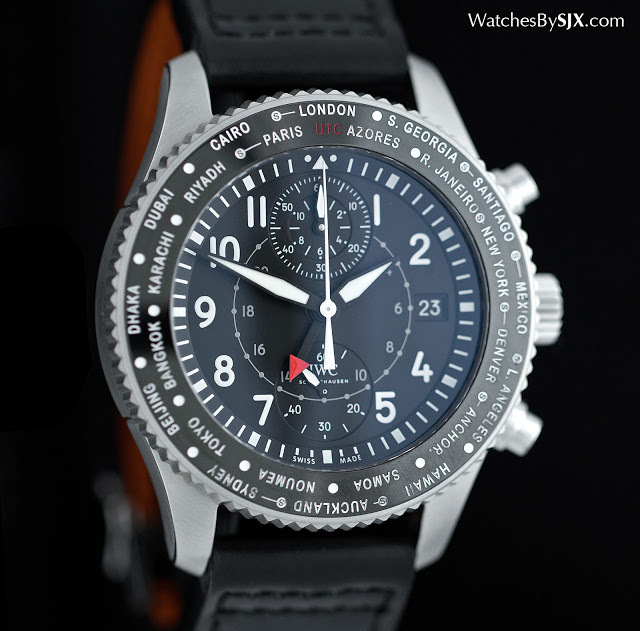 Priced the same is the Pilot’s Watch Chronograph Top Gun Miramar, which is essentially the same watch packaged differently. The case is glossy ceramic, a trademark of the Miramar line. It’s also 44 mm in diameter, 2 mm smaller than the watch it replaces. 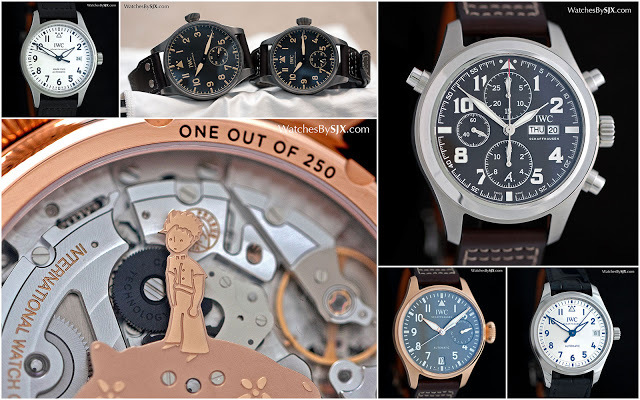 Another new chronograph is the Pilot’s Watch Double Chronograph Edition “Antoine de Saint Exupéry” with a dark brown dial that’s the signature of the line named after the French author. This is stainless steel, 44 mm and limited to 1000 pieces. It’ll cost US$11,900 or S$18,200. 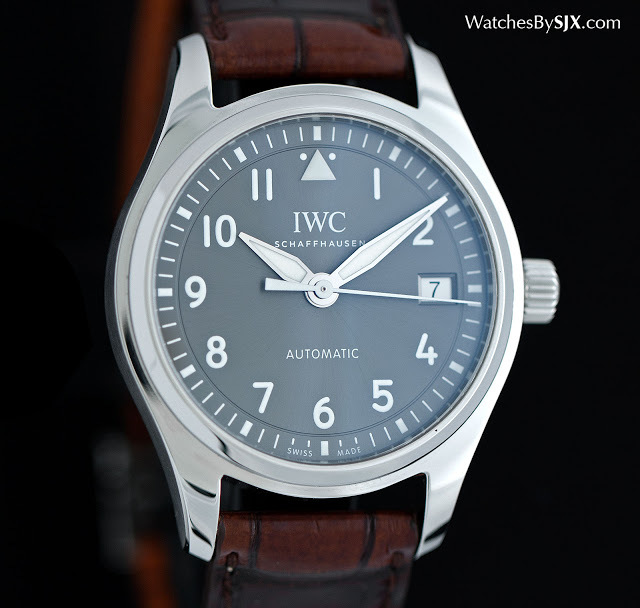 And the last watch is the one with the most technical novelty, being equipped with a patented world time mechanism IWC acquired from independent watchmaker Vogard. The key feature of the Pilot’s Watch Timezoner Chronograph is a black ceramic bezel engraved with the 24 cities that represent the time zones around the world. Rotating the bezel moves the hour hand, red-tipped 24-hour pointer and date, so the wearer just needs to set the bezel to the appropriate city as he crosses time zones. It’s intuitive and easy to use. And because the bezel needs to be pushed downwards to turn it, accidentally changing time zones is difficult. 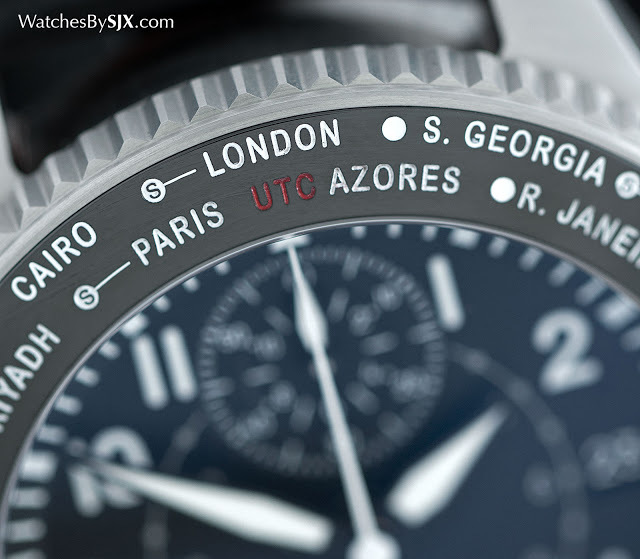 The case is a largish 45 mm, while the dial is busy as it also features a chronograph. 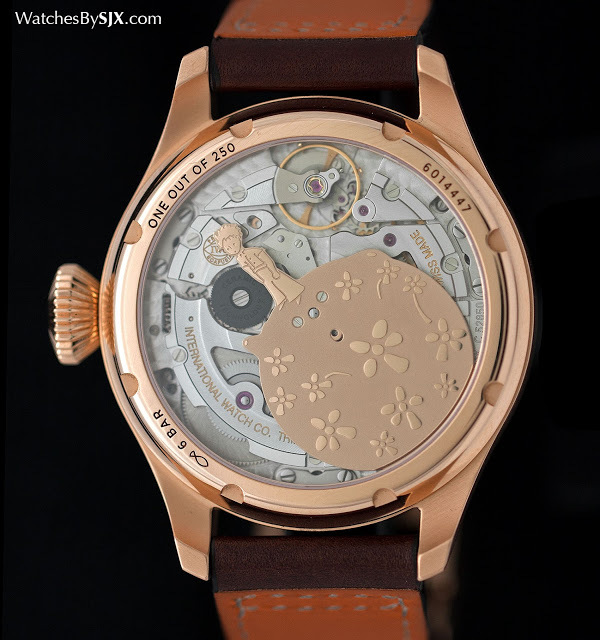 The movement inside is the calibre 89000 automatic with flyback feature. It is priced at US$11,900 or S$18,400. 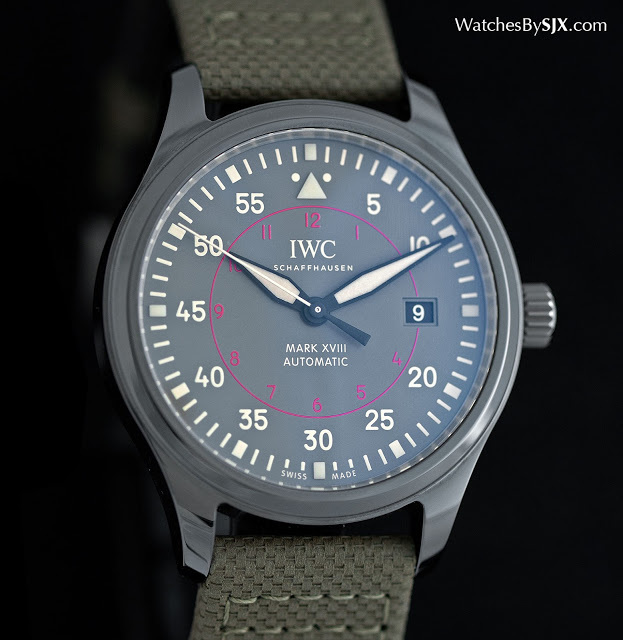 Update February 6, 2016: Addition info on case diameters of Top Gun and Miramar watches added.